Philadelphia Jack O'Brien [https://www.flickr.com/photos/library_of_congress/2163722564/] In December 1920 Tex Rickard announced he was building the world's largest gym in Madison Square Garden (including, in the summer, the world's largest pool) and that Philadelphia Jack O'Brien would be the "physical director". The 1/5th mile track ran around the roof of the old MSG. [https://www.flickr.com/photos/[email protected]] Thank you for the information on O'Brien and Rickard. Would you have a source that shows the construction date of the track as 1920? I'm able to confirm everything else for the catalog record, but that would allow us to establish a better date for the photograph. This photo appeared in the Boston Evening Globe, Wednesday, December 29, 1920 - Page 13. 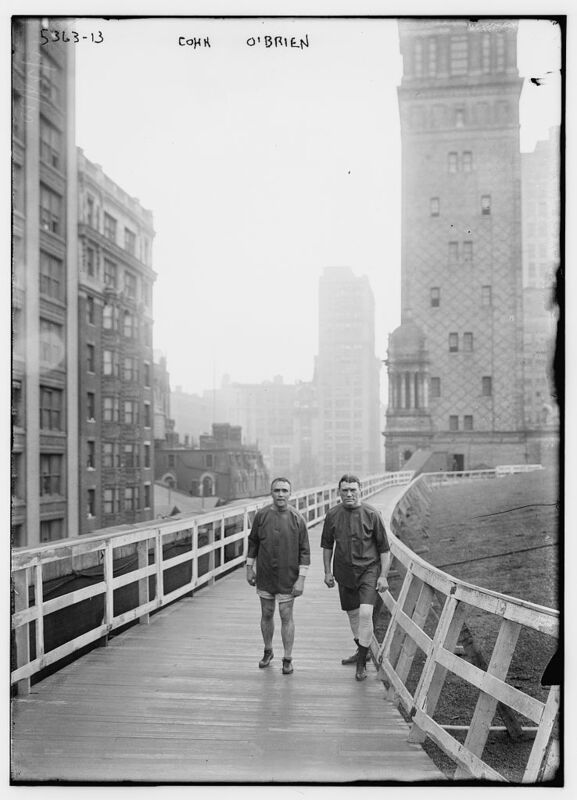 In the accompanying picture Harvey Cohn and Philadelphia Jack O'Brien are seen ready to start off on a long jaunt" Cohn was a former member of the Irish Amateur Athletic Club who competed in the Olympics in St. Louis in 1904, 1906 in Athens and 1908 in London. He coached at Indiana and Colby. He coached the Japanese team at the Antwerp Olympics in 1920. His gig atop the Garden didn't last long, as by the summer of 1921 he was announced as the new coach at New Hampshire. O'Brien announced in 1922 that he was ending his association with the Garden and opening another gym on Broadway. [https://www.flickr.com/photos/[email protected]] Thank you! The additional identification of Cohn is greatly appreciated.